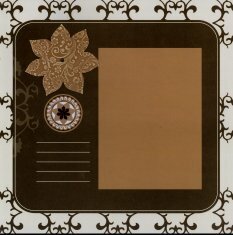 Here are some examples of Scrapbook Layouts using Coredinations ColorCore Embellishments from the Core'dinations Color Core Cardstock. Core'dintions has one color on the outside of the paper and another color for the inside Core, thus the name. When you tear this paper you can get the color of the core to show and you can sand or distress the top surface to allow the color inside to show. 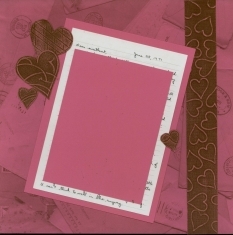 These 2 Layouts use some of the Chocolate Box (Dark Chocolate - Black Cherry) embellishments, mixed with card stock from Club Scrap's February 2004 kit - To You With Love. 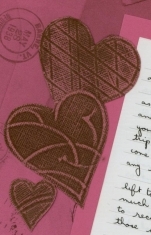 Sorry for the pink cardstock over the handwriting in the letter, but that was too private a message to share here. To make these hearts, I dry embossed heart shapes from the back of the Color Core Core'dinations Cardstock and embossed some lines and shapes within the hearts also. On the chocolate side, I lightly sanded until the Black Cherry color underneath came through. 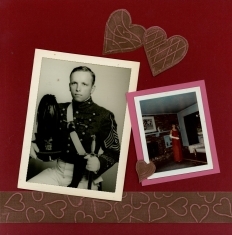 This stripe of the Color Core Core'dinations Cardstock was dry embossed from the back or Black Cherry side with a smaller heart pattern turned at a different angle for each embossing. Again, I lightly sanded the Chocolate side until the Black Cherry color underneath came through. This Cardstock goes a long way and seems to match very nicely with solid colors. Here are a few more Coredinations ColorCore Embellishments. This layout above uses some of the Chocolate Box on French Vanilla. Below are close ups of the Core'dinations elements. 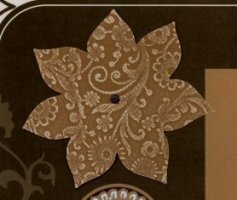 This embellishment was cut with the Spellbinder Poinsettia Plate and then Embossed with the Spellbinders Flowers Impressabilities. It was then sanded lightly with a sanding block to uncover the Ivory core of the paper in the pretty flower design. 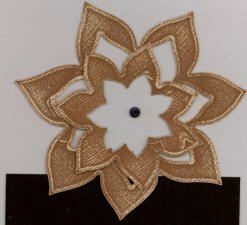 This embellishment was cut using all 3 of the Spellbinder Poinsettia Plates. After embossing, each separate piece was lightly sanded, and added to the page with a copper brad for the center. These Core'dinations Color Core Cardstock embellishments actually used the center and smallest of the Spellbinder Poinsettia, and the left over pieces of the Chocolate Box Coredinations Card Stock cut into leaf shapes. Each leaf shape was scored with a Bone Folder from the reverse and lightly sanded for the veins in the leaves to appear. 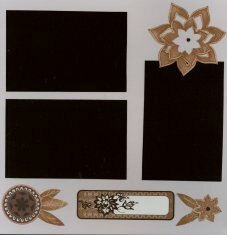 We will add some more examples using the Core'dinations Color Core Cardstock for Embellishments.